I’m a bit embarrassed that it’s taken me this long to post my September habits! I wrote them at the beginning of the month as always, but I kept putting off posting them. I honestly think my subconscious may have procrastinated because I am slightly ashamed that several habits this month are repeats! Agh! I was slipping with a few things since the start of school that I want to bring back into focus or keep in focus from last month. Chalene Johnson mentions in one of her Push trainings that the reason habits stick isn’t just dependent on if you’ve focused on it for 21 or 30 days… it actually has to do with the feeling that you get when you complete the task or activity and if you become addicted to those feelings. So if you’re trying to stick with something new, make sure that you’re stopping to reflect on how it’s making you feel! 1. Step out of my comfort zone for 1 minute daily. This is definitely a repeat, but I made it more specific based on Darren Hardy’s mentoring program. He suggests that it actually only takes 1 minute of courage each day to drastically change your life. I’m on it!! 2. Review my yearly goals every day. This is a strategy I learned through taking Chalene Johnson’s 30 Day Push challenge. She has you write your yearly goals out every week and reflect on them often, adding 2-3 new things to your daily to do list to move you in the right direction. So far… when I do it… it’s working! Expediting my goals drastically! 3. Accomplish my Daily List each day. This is another Chalene tip. The 30 Day Push is an amazing challenge and really helped me refocus and prioritize my time at home and at work. I write a daily MUST be done list (MBDL). In August, I almost always had 1 nagging task left at the end of the day. I want to get over this! This habit actually relates to habit focus #1 because the leftover task usually was on that required a bit of vulnerability or courage. So far, I’ve been able to improve in this habit by focusing on the feeling I have after the task is complete, when my to do list is done, and when I can relax! I thankfully also have daily mentoring from Darren Hardy that pushes me each day to be my best! 4. Complete 2-3 Goal Tasks: This goes along with habits #1 and #3. 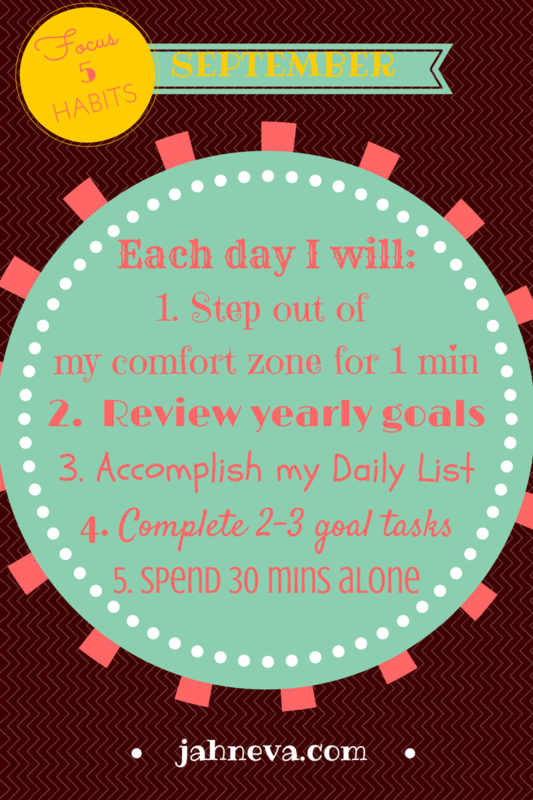 Every day, I add 2-3 tasks to my MBDL that directly relate to my bigger year-long goals. This allows me to always be moving toward those bigger goals. It felt challenging when I first started doing this because I usually have a lot on my list already. But, the feeling that I get when I know that I’ve moved closer to a big goal is pretty addicting… I think this one is definitely going to stick. 5. 30 minutes of Alone Time Daily: This is consistently one of the harder habits for me to keep up with but I also know the negative result if I don’t take this 30 minutes… stress, frustration, and wandering off track (dramatic I know 😉 ). My personality, ENFP if you know the Myers-Briggs, thrives on interactions with others. However, the most important thing to my personality type is that our actions align with our beliefs and values. If I don’t take 30 minutes to make sure my are actions and habits are aligned with my beliefs and values (and goals), I get way out of whack, end up wasting time, and then getting frustrated about it. Hope some of my habit insights have given you some things to consider this month! What habits are you working on? What habits do you wish you were working on? PS– I realized in this post that I shared a lot of tools or programs that have helped me become successful. Look forward to a post detailing these life changing programs!